Do you want to bend the ears, send a fax, to the BC Government Officials who sit in support of the Premier's Office? 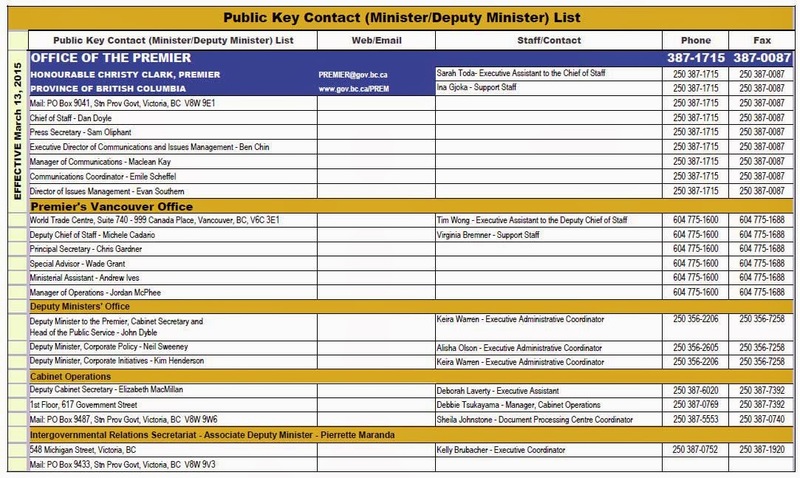 BC Minister / Deputy Minister Telephone List historical INDEX starting at January 7, 2002 to now. great job at cfax……….!!! what would it take to have you do a show with Palmer and the Voice of BC….??? any thoughts???? In general, what RossK at The Gazetteer calls the Lotuslandian proMedia Club does not like to be criticized. For them, self-examination is a faint skill and they really have no time for unrelated critics. Young adults don't know the pain of those days. I recall that we struggled to make our monthly mortgage payments and, at the end of the year 98.3% of the payments went to interest and 1.7% went to principal. Imagine the state of British Columbia's finances when interest rates rise and we have to service debt of more than $100 billion. It will result in unprecedented austerity. But, hmmmm, maybe that's the intended strategy of the one-percenters. They are the acquisitors in times of financial trouble. We bought into the North Shore market in 1975, down payment of $10,000 with a $40,000 mortgage for a 50' lot c/w 910 sq. ft. house!!. The family next door, two years earlier, paid $26,000 for TWO 33' lots with their house straddling the two lots. We hit the 18% mark and survived, a lot of our friends who bought grander homes, didn't. So interest rates are being held down, because a rise would lead to defaults, because of massive household and government debt accumulation.